native to USA (Texas) and Mexico (Coahuila, Nuevo León, Tamaulipas). 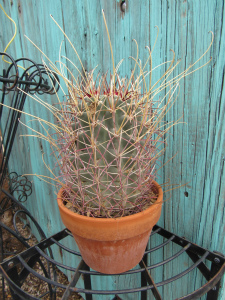 A small fish-hook cactus with a large fleshy turnip root, neck-shaped grown together with the stem. The spines varies from yellow to brown and often prevent the flowers from opening fully. Solitary (unless injured) until very old age, or with few branches from ground level when old. Seedlings and immature plants often have narrowly cylindrical stems. With age, the stems broaden distally. Need a relatively large or deep pot to accommodate their extensive roots.